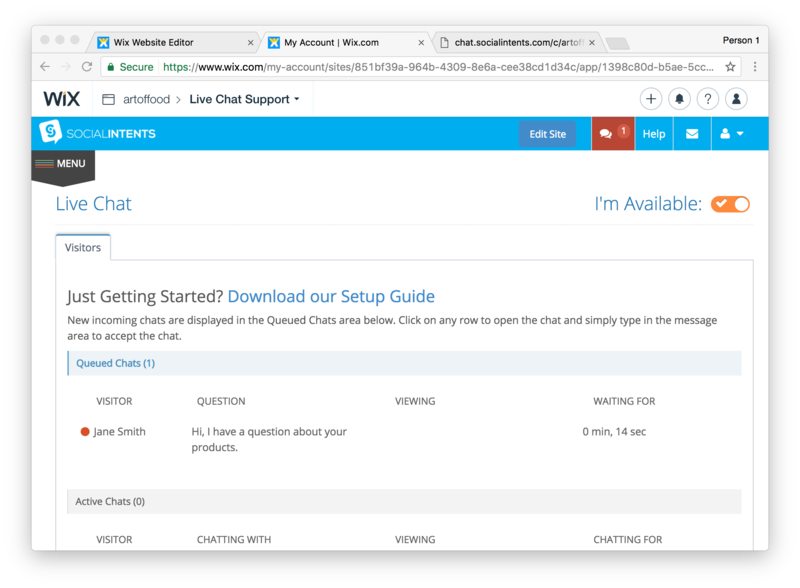 This guide is to help you get started with Live Chat Support on your Wix website. 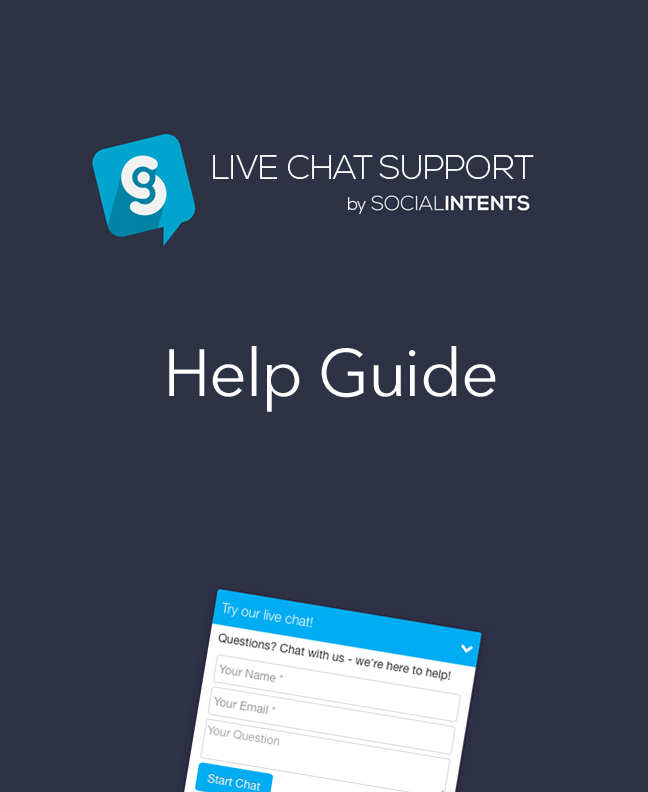 If you have any additional questions after reading this guide, please chat with us or email us at support@socialintents.com. 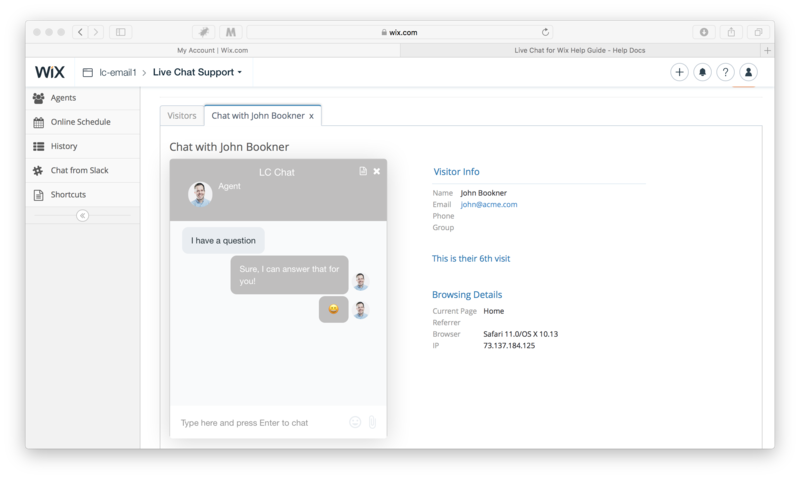 If you haven't installed Live Chat Support for Wix yet, head on over to our Live Chat Support app in the Wix.com app market. Just click Add App to add live chat support to your site. We don’t require any signup or login outside of Wix. Next, customize your settings by clicking on the Chat Tab in your editor, then save. That’s it, you’re ready to chat! We offer an always free plan that is limited to 20 chat sessions per month. After that, we offer a competitive Premium plan for Wix customers only that is more than 75% off our regular pricing plans. With Live Chat Support, you can chat with your website visitors right from your Live Chat Dashboard in Wix. Agents can also login directly on our website at http://www.socialintents.com with their email address and password that you configure in the Agents section of the Dashboard. To Access your Live Chat Dashboard from Wix, select your website the click on the Site Manager link. You will see "Live Chat Support" listed in your apps. 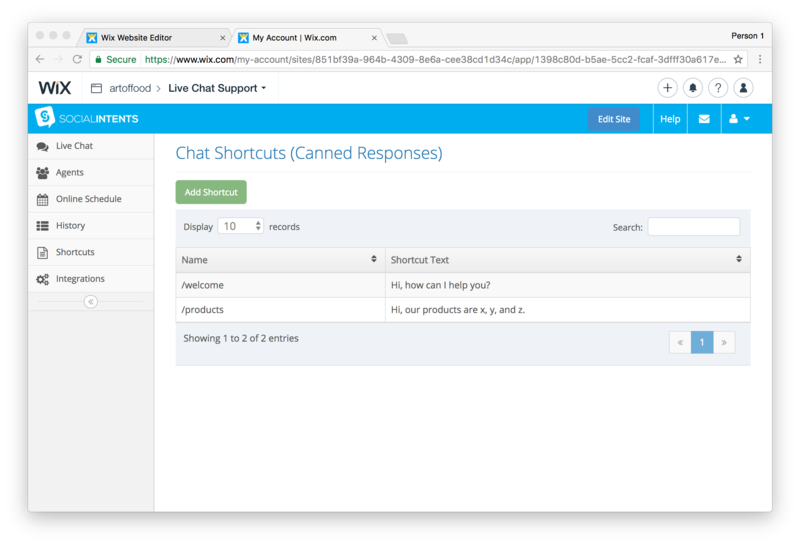 The first time you click on Live Chat Support, you’ll be prompted to accept Notifications. Make sure you answer yes so that you can receive inbound chat notifications right on your desktop as popup notifications. Desktop notifications are supported on Chrome, Firefox, and Safari. 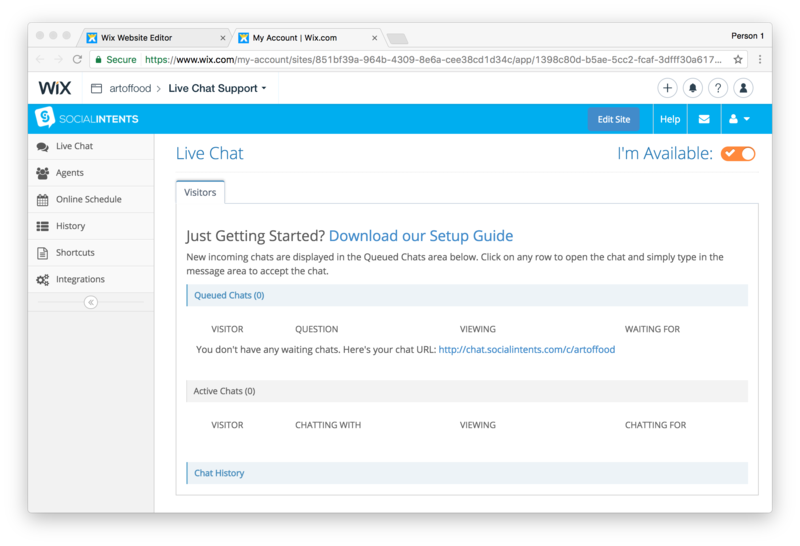 To access the Live Chat Dashboard from your Editor, click on the Live Chat Support tab to open your app settings. Then you’ll see a “Dashboard” button near the top. Click here to open the dashboard in a new tab. 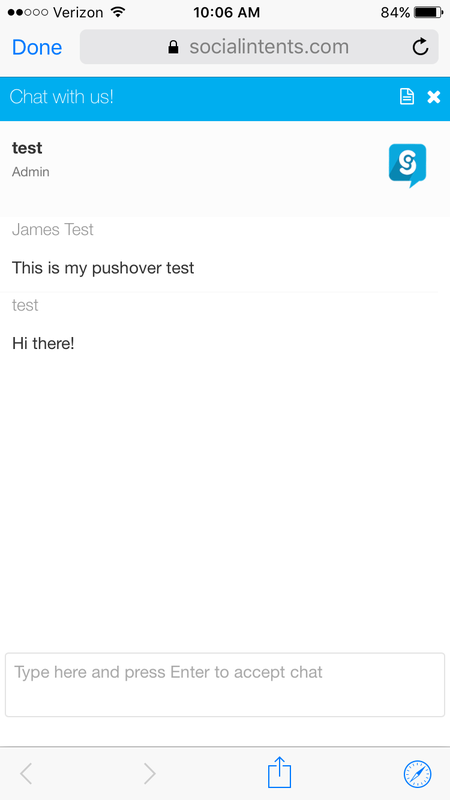 Chat on your mobile from using our Pushover.net integration. To answer a chat, simply click on the row in the Incoming Chat Requests table. 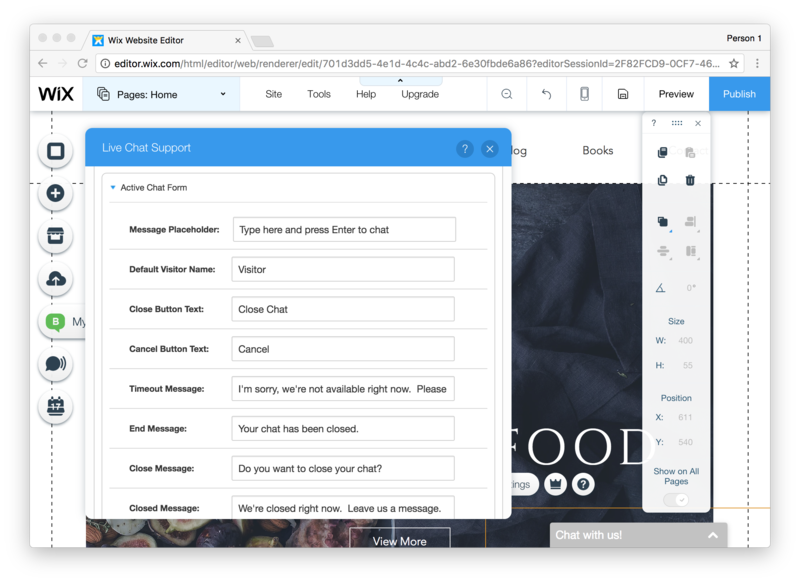 As soon as you enter text in the chat box, your chat is accepted and you’re talking to your website visitor right on your website. After you click on a row, a new tab will open with the chat you selected. Just type text into the message area to accept the chat and start a conversation with your website visitor. We support a variety of chat notifications including HTML5 desktop notifications, Slack notifications, email live chat notifications, and mobile push notifications using the 3rd party pushover.net mobile app. 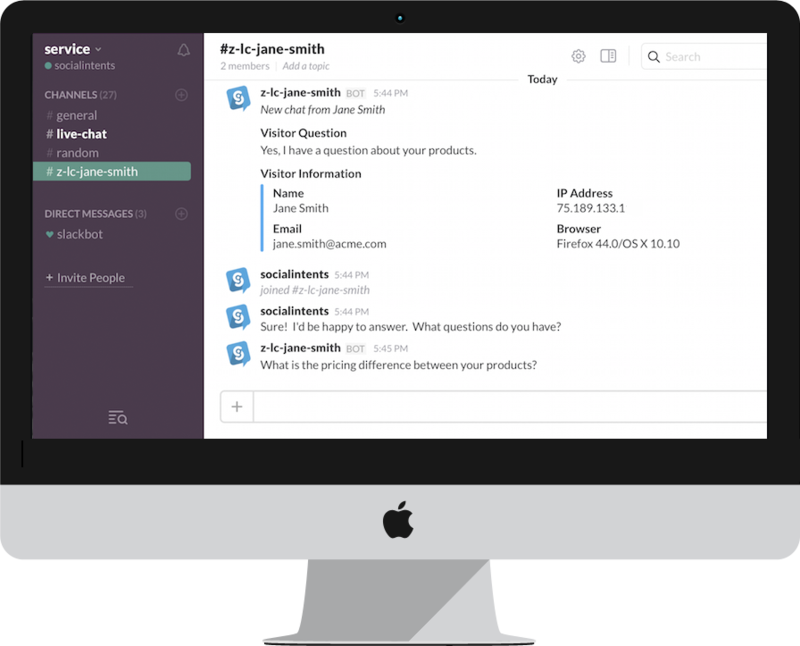 We have native support for chatting right from Slack on your desktop or mobile phone. This is great if you want an always on native application with mobile push notifications. Click here to see how to enable Slack in your Wix. If you’re likely away from your computer, we have a setting under your Agent settings called “Stay Available Even When Not Logged In”. Be sure to enable this option if you want your Live Chat to stay online even when you’re not. That way, you can receive an email of any incoming requests. Simply click on the Open Chat button in the email to go right to that chat and start chatting. You can even do this from your mobile phone! If you want to chat from your mobile phone and need immediately inbound notifications, we suggest downloading the Pushover.net mobile app. Once you sign up, they email you their Pushover User Key. Simply go to your Agent settings → Notifications and choose “Enable Live Chat Mobile Push Notifications” and copy/paste this key into the Pushover User Key text field. You’ll receive a mobile push notification right to your phone for every chat request. Just click the link in the notification to open the chat right on your mobile phone. This is a great way to always ensure you’ll answer all of your live chats. Here's what the chat looks like once you open the chat in our web optimized browser on your phone. 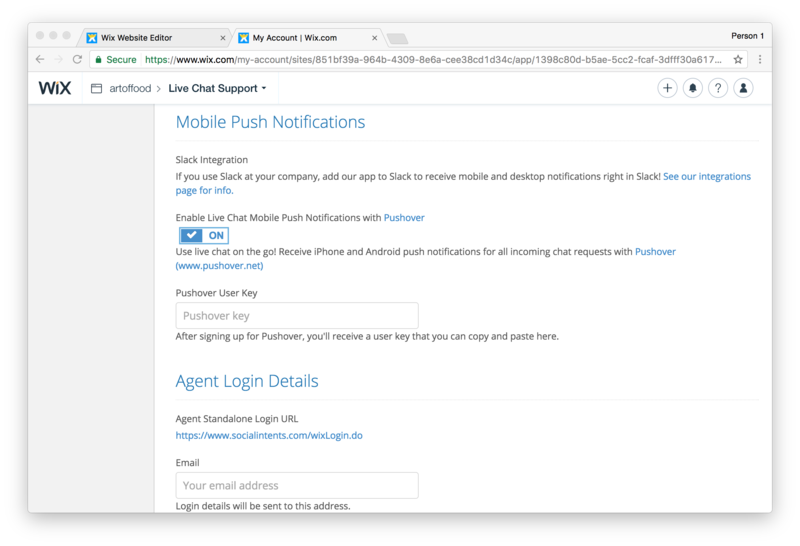 To enable the mobile push notifications, select “Enable Live Chat Mobile Push Notifications” then copy your Pushover User Key into the Pushover User Key text field. See this article for more details. 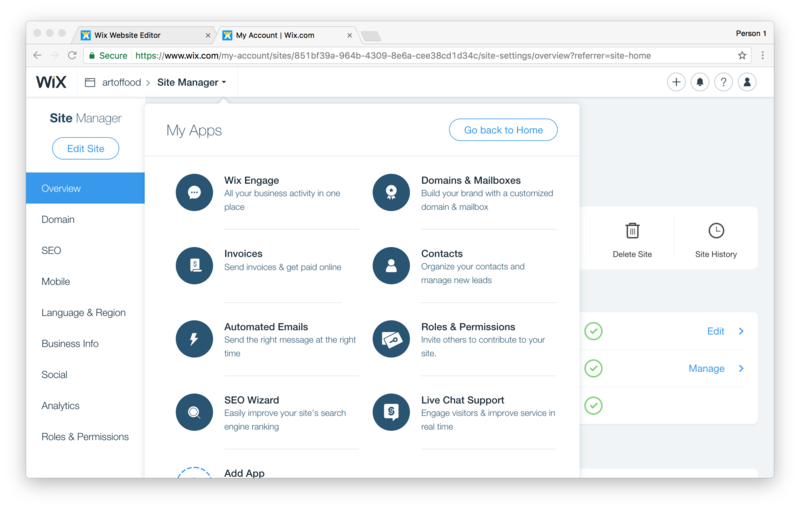 All of the configuration options for your Live Chat Support app are configurable right from Wix. Open your website editor and click on the Live Chat Support tab. Our Live Chat details will open. Select the “App Settings” button to open the Settings Editor. Notification Email: This is the email address that you can receive new live chat requests on. When you enter this, you will be notified via email for every new live chat request. Chat Tab Visibility: This is a Premium Feature that allows you to completely hide the chat tab on your site when you’re offline. The second tab allows you to modify what information you collect on the Pre-Chat Survey, change default colors, as well as an option to use a custom Logo or Agent Image on the chat. Logo/Picture: By default, the Social Intents logo is displayed to the visitor once a chat is started. You can upload your own logo or a custom agent image. This feature is enabled for Premium customers. Chat Tab Color: Choose your tab colors and chat header color that matches your site. You can customize every single field name, text, and message that is displayed in your live chat. This level of customization is what sets our live chat apart. Customize the text for your brand, or translate it for your language. The changes are picked up automatically on your site, so no need to republish. You have complete control over when your chat tab is online or offline. 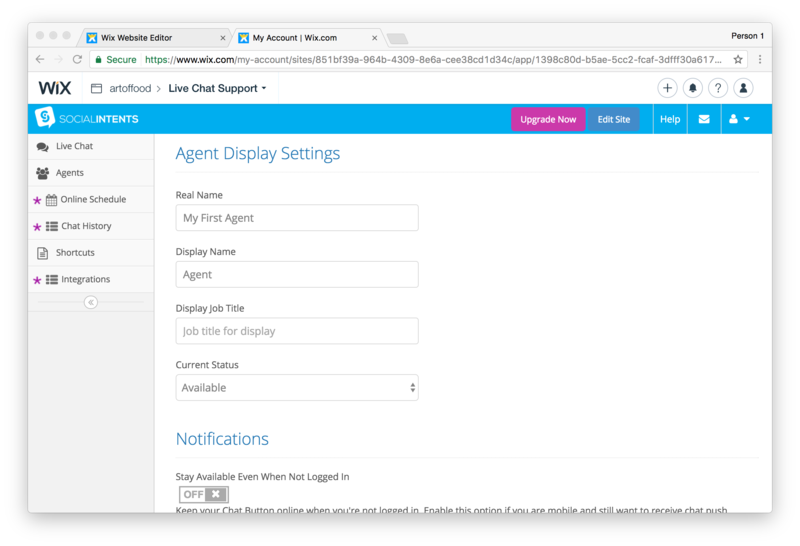 These are controlled by your Agent Availability in the Live Chat Dashboard. When you open the Dashboard, you are automatically made Available by default. This then changes your Live Chat widget to Online. With multiple agents, if at least one of you are Available, then the chat widget will be online. If you want to force the chat widget offline, change your status to Unavailable. 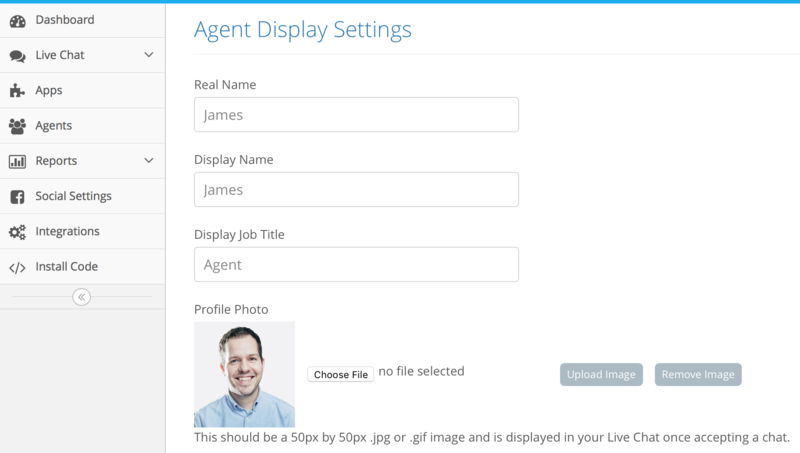 For multiple agents, as an administrator, you can click on the Agents tab, and select each individual agent and force them offline. Easily add agent photos to your live chat by selecting your preferred agent and uploading a 50px by 50px image. Once a live chat is answered by that agent, their photo will appear. We store all missed and offline messages right in our app so you never miss them. Use the History link to search on and view all chat transcripts, missed, and offline chats. Easily responds to any. With Live Chat on Wix, you can set up as many agents as you like after upgrading to the Premium plan. Current Status: Whether the agent is online or offline. You can force someone online or offline here using this field. 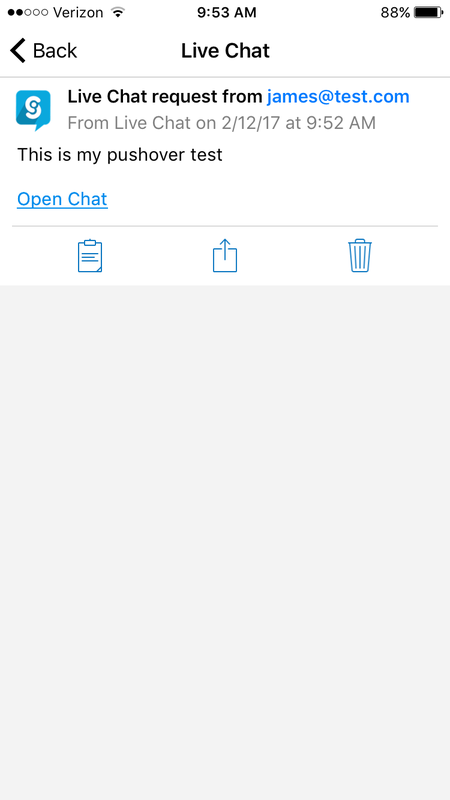 Use the Notifications area of the Agent Details to configure how the agents will be notified of new chat request, either Email or Native Mobile Push. Need to enable Live Chat on your Wix Mobile Site? Here's our article on Enabling a Live Chat button to your Wix Mobile Site. 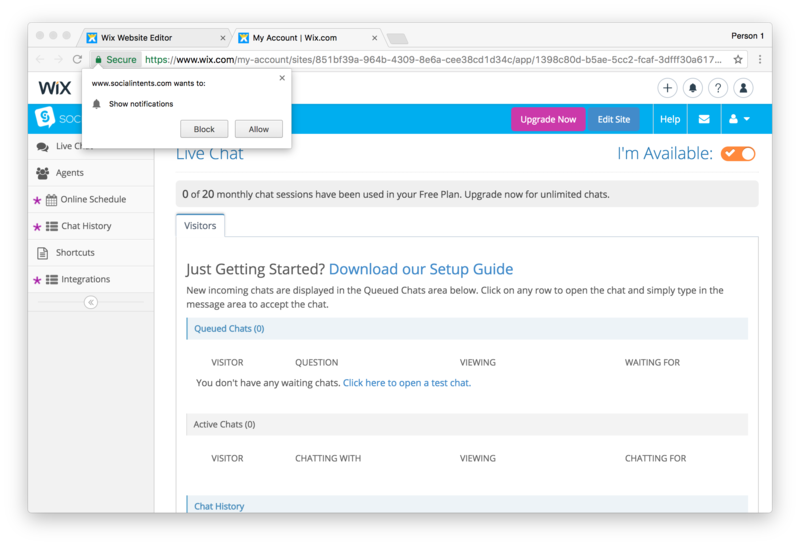 Make sure to login to your Live Chat Dashboard every morning to change your chat from Offline to Online.